Helping you put the pieces together. 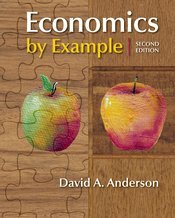 Economics by Example introduces the principles of economics with enticing, real-life applications. The goal is to help readers understand how their lives are immersed in economics as they learn critical concepts. The thirty chapters address hot topics such as globalization, Internet piracy, legal reform, outsourcing, environmental policy, immigration, and big-box retailing, all within the framework of economic principles. In a refreshing pedagogical approach, stories rather than diagrams explain economic concepts in the context of choices and policies relevant to today’s students. The explanations are lively, surprising, and replete with solid economic content. Each chapter ends with a set of discussion-starting questions to encourage in-class reflections and debates.